Can Brazil promote change without changing itself? Brazil has an adroit capacity to identify problems in the way human rights are being addressed internationally. But Brazil needs to set an example through its own actions. A contribution to the openGlobalRights debate on Emerging Powers and Human Rights. Português, Français, Español. There has been a lot of talk about Brazil’s new status on the international stage. The South American giant has long aspired to be an international heavyweight but it was only under the government of Luiz Inácio Lula da Silva (2003-2010) that this aspiration started to become a reality. The combination of domestic stability – of both the democratic institutions and the economy – and an ambitious and more assertive foreign policy created the right conditions for Brazil to burst onto the world stage as one of the most dynamic and exciting emerging powers. Brazilian foreign policy has frequently challenged the international status quo, which is characterized by the unequal relationship between north and south. The guiding principles of its foreign policy - non-interventionism and peaceful solutions to conflicts - set Brazil far apart from the often interventionist approach of established western powers. Brazil is in a strong position to assume the important role of challenging the status quo in the international arena. Considering national aspects, it is a democracy, still consolidating like all democracies, but with solid institutional and societal foundations. It has a stable economy, which has proven resilient to various financial crises in recent years. Domestically, it has been attempting to reduce inequalities and combat poverty and social exclusion, and it has even been considered a model for other countries. Although serious violations persist, such as a medieval prison system and a tendency to favour infrastructure projects over the rights of vulnerable communities living in their paths, Brazil has managed to keep up a positive image in international affairs. Flickr/Blog do Planalto. Some rights reserved. This bold, resource rich, vibrant and ethnically diverse country is in many crucial ways in a stronger position than its fellow emerging powers to achieve great things on the international stage. The country does not have hostile relations with any of its neighbors. Moreover, it has developed, over the course of its diplomacy, an enviable capacity for dialogue with a wide range of countries from both the north and the south, including non-democratic regimes. Finally, it was never a colonizer that dominated other nations. Of all the various international agendas, Brazil has the potential to have real impact on human rights. Generally speaking, the Latin American giant has a critical view of the current international human rights system. It has adeptly and courageously identified real problems in the system and challenged them. But it has not yet come up with good enough alternatives. The Brazilian government has criticised the ‘naming and shaming’ approach to human rights taken by the west. The argument is that such tactics risk further isolating violating regimes and fueling radicalism. Instead, the current Brazilian government proposes dialogue and cooperation as the way forward. But critics have argued that this approach risks appearing to endorse attitudes towards human rights violations that are complicit and complacent. If Brazil wants to encourage dialogue and cooperation, it must clearly present a minimum standards approach for human rights, or risk seeming to tolerate abuses. Second, Brazil should show how it has determined that cooperation and dialogue can achieve better results than finger pointing. Brazil has shown an alarming reluctance to speak out, however, about human rights issues in its bilateral relations. It has used the so-called “glass houses” argument – which says that countries should not take on the rights problems of others when they all have many of their own – to justify its silence on human rights during state visits to countries like Cuba. President Dilma Rousseff did not raise the issue of Guantanamo on a US visit either, despite being urged to do so in writing by the Brazilian NGO Conectas Human Rights. The government has said it prefers human rights issues to be addressed in multilateral settings. But Brazil has done very little to take its concerns to the multilateral system. It is critical of the selective and somewhat undemocratic functioning of the international and regional bodies, but it has rarely followed up with a more purposeful or constructive posture. Perhaps the closest to a concrete contribution Brazil has made to shifting the status quo has been the proposal of the concept of “Responsibility while Protecting” (RWP) in Security Council debates about the use of force to protect civilian victims of human rights violations. 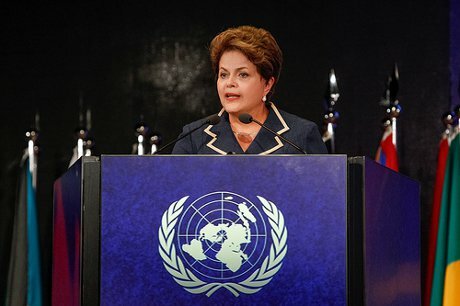 The Brazilian proposal, presented by Rousseff at the UN general assembly in 2011, was a constructive response to widespread concern that the NATO intervention in Libya had overstepped its mandate. RWP calls for better definitions and monitoring of the use of force within the framework of Responsibility to Protect (R2P), the basis on which the Libyan intervention was approved. The concept of RWP needs to be developed but it is a start. In the case of Syria, the Rousseff government has not worked purposefully towards resolving the crisis and has remained well within its comfort zone. On repeated occasions, the government has made it clear that it does not support a military solution to the Syrian crisis, but it has not indicated which concrete multilateral measures it does support. The referral of the case to the International Criminal Court, for example, does not have the support of Brazil. The Brazilian bid for a permanent seat on the United Nations Security Council is well known by now. The democratization of the body, according to Brazil, will result in more effectiveness and efficiency. It is recognized, however, that apart from the anachronism of its composition, the Security Council faces problems beyond the expansion of the number of seats. So far, Brazil’s proposal – supported by the so-called G4 (Germany, Brazil, India and Japan) – is to join the club without necessarily altering the rules of the game. The issue of veto power, which is so central and sensitive, is not directly addressed by the current G4 proposal, which states that the right to veto of the current five permanent members will not be the subject of debate or alteration for at least 15 years. Given that Brazil, in its Responsibility while Protecting proposal, has raised the issue of accountability for the military operations authorized by the Security Council, it would be interesting if Brazil were to call for greater accountability in the Security Council itself. So far, however, Brazil’s idea of reform of the Security Council has focused solely on increasing the number of members. Whether it is questioning the policy of naming and shaming, the selectivity of the international human rights system or the irresponsible use of force in international affairs, Brazil has an adroit capacity to identify problems in the way human rights are being addressed internationally. But it is not enough just to raise criticisms. Brazil needs to present concrete alternatives and set an example through its own actions. If Brazil truly wants to be a driver of change it will have in future to be far more bold.